From its white sandy beaches to its world-renowned architecture, Barcelona is a city of beauty. It has everything you could want in a vacation and so much more. However, the true beauty of the city can only be found from its rooftops. Once you’re done eating Barcelona foods, exploring the busy streets and relaxing beaches, be sure to take a visit to the skies. Barcelona is home to many of the best rooftop bars in Europe and here under the stars is where you will find the secrets of the city. Be sure to stop by one of these rooftop bars for a drink and magnificent views. Considered by many to be the best rooftop bar in Barcelona, Sky Bar has the most breathtaking views of the city. With its beautiful deck smack dab in the city center and magnificent infinity pool, Sky Bar is a real urban oasis for those who want to enjoy a delicious cocktail and see close-up views of the city. Here the drink prices are cheaper than most rooftop bars, so you won’t break the bank while you enjoy the luxury of floating above the city. La Dolce Vitae is luxury and glamour at its finest. Considered one of the best rooftop bars in Barcelona for the rich and the famous, a night here will make you feel like a star beneath the night sky. At sunset, famous DJs take over the night while you kick back on a sofa or relax by the pool. The best part is that its root fop terrace also follows suit by offering amazing views of the whole of Sagrada Família and Montjuïc. In addition to this, you will find extensive culinary offers that have been supervised by the Michelin-star chef Nandu Jubany. 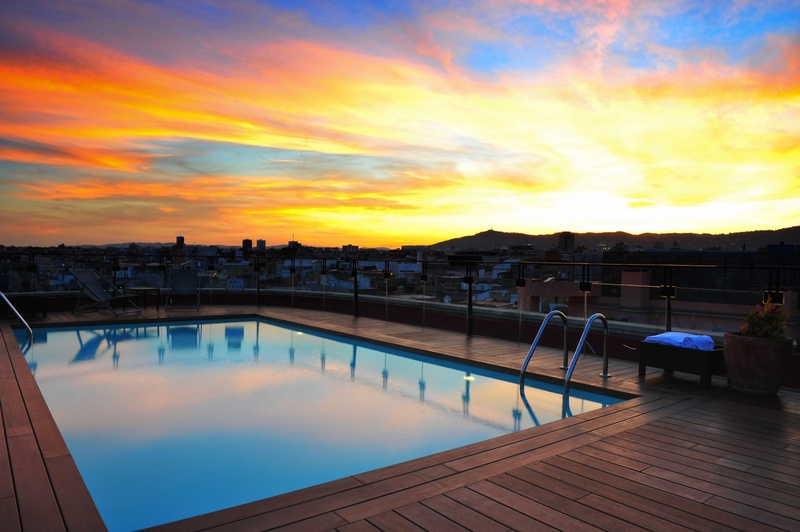 The B-Bar provides a great view of Plaça Espanya while you relax next to the too-blue-to-be-true pool. Despite the bar’s perfect location and luxury accommodations, B-Bar is affordable and provides a relaxed, casual atmosphere that is perfect for winding down after a day of work, a long day of sight-seeing or for a birthday invitation with friends. Although it’s not known for its views, the cozy garden feels and cheaper prices are what makes the Hotel Pulitzer Rooftop bar popular for a younger crowd. There is a DJ every Thursday and Friday night and an acoustic concert on Wednesdays from 7-10PM that help to liven up the night sky. With beers priced at €3.50 and special cocktail deals nightly, the prices are hard to beat anywhere else in Barcelona. It is the perfect place to chill and relax as you sip mango margaritas and enjoy the vibes of the evening. La Isabela is named after an exotic island in the Philippines, this hidden gem offers cozy music, unique cocktails, and authentic tapas against a 360-degree view of Barcelona. Locals and tourists both flock here for the satisfying combination of delicious drinks and fine cuisine. For those that don’t drink or would prefer a quieter time with the city views, La Isabela also does breakfast on its terrace during the summers. You can enjoy the morning sun shining down on the city while sipping on hot chocolate or a quality cold brew. Standing elegantly at the tip of the Barceloneta beachfront, the Eclipse Bar is another location that offers incredible panoramic views of the whole city plus fantastic asian foods and cocktails. In fact, the surrounding Mediterranean view will leave you feeling as if you are on your very own private island. The bar is located on the 26th floor of the famous W-Hotel and transforms into a very lively music lounge when darkness falls. If you are looking for a rooftop bar that has not yet been discovered by many tourists, La Terraza is the place to be. Located just a walking distance from Plaça Espanya, the bar is cozy and fully furnished with an intimate atmosphere. While the panoramic views from La Terraza may also not be as glorious as that of other rooftop bars, it prides itself with the live music sessions that happen over the weekend and a fantastic culinary offer. For the medieval and gothic geek lovers, The Panoramic Terrace offers outstanding views to Barcelona Gothic Quarter. It is a relaxing place to be, considering the flock of tourists that walk around this area. Located just in front of the Barcelona Cathedral, the two-level deck has sufficient space for you to enjoy a vermut under the stars. The Ohla Hotel has an eclectic facade, but something better is on the inside. At the 8th floor, there is a chill terrace with a somehow luxurious ambiance. Their cocktails are top notch and the place is always harmonious. And just to top up your experience, the two restaurants and wine bar located downstairs are worth the visit. El Sueno de Picasso terrace at The Serras Hotel is the rooftop gem of Barcelona. It is one of the few places that offer bird-views over the harbor and that is open all day long. Over the weekends expect live music and a fancy crowd that warms up before the fiesta begins. If you are someone who fancies having a Crown Royal Reserve drink while taking in views from high above, these roof-top bars are sure to help you forget about the heat and the city commotion for a relaxing night in the heavens. However, be sure you arrive early as they are very popular and tend to become packed on the weekends when the weather is good. Visiting the city and hungry to discover its real side? There’s no better way to do it than going on a Barcelona food tour! From traditional and trendy cuisine to tapas and brews, You will discover amazing sites, views, and tastes of a city that lives on amazing gastronomy.